That clip was both awesome and depressing at the same time. Awesome for obvious reasons of course, but depressing because of the fact that practical effects are becoming more and more extinct each day in horror movies. It’s this scene in The Howling that helped me to talk about it in the same sentence as the classic An American Werewolf In London. 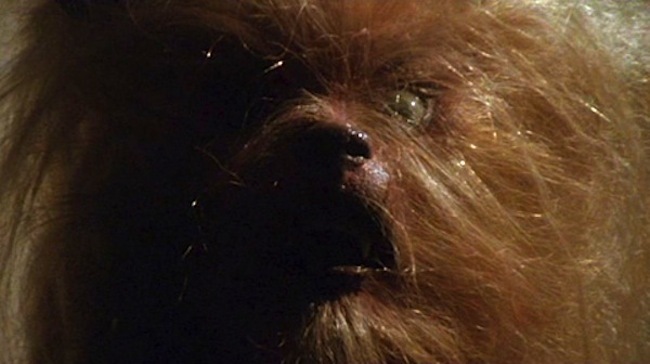 Rick Baker’s work in the latter was outstanding, but Rob Bottin one-upped him in Joe Dante’s film and gave us some special effects that will stand the test of time. Minus the cute Chewbacca looking werewolf version of Dee Wallace Stone in the movie’s final frames of course. This entry was posted in Feature and tagged 1981 horror movies, 1981 werewolf movies, an american werewolf in london, best practical effects horror movies, dee wallace stone the howling, dirty horror, eddie quist the howling, eddie transformation the howling, feature, joe dante the howling, karen white the howling, rick baker american werewolf in london, rick baker makeup, rob bottin, rob bottin the howling, robert picardo the howling, the howling, the howling werewolf, the howling werewolf transformation by Dirty Horror. Bookmark the permalink.